While it was tempting to kick back and relax after the solar system was up and running, I knew it’s important to keep an eye on things and fine tune the charge controller and inverter settings for optimal performance and reliability (OK, I’ll admit I patted myself on the back the first night and cracked a celebratory brew). That’s especially true when you’re dealing with a battery bank, which is easy to damage if you’re not paying attention (particularly flooded lead acid). Fortunately our system came with some useful monitoring tools, including a web-based component developed by Outback–called OpticsRE–that makes it easy to monitor and adjust the system from virtually anywhere. I once checked in with a smartphone while riding on a ski charlift during vacation, saw that one of the arrays wasn’t producing, and made a simple adjustment to fix it. Pretty remarkable technology! One area that bears close watching is the battery bank state of charge and charging parameters. It’s best to avoid discharging flooded lead-acid batteries by more than 50% capacity to preserve battery life, and during recharging cycles it’s important to adhere to the battery manufacturer’s guidelines in terms of voltage and current. In our case the battery bank is discharged only when the grid goes down (a rare occurrence for the time being), so we aim to keep it fully charged at all times. This requires adhering to a specified “float voltage” during the day when the solar panels are producing–enough to keep the bank at full charge, but not so much as to overcharge. The float voltage varies with temperature (lower voltage at higher temps. ), so we installed a temperature sensor on the side of one of the battery cases in the middle of the bank, and the Outback system automatically adjusts the voltage based on temperature readings. Maximum current in or out of the bank is restricted by settings in the control unit, and the battery manufacturer specifies these numbers. It’s also important to inspect a flooded lead acid battery bank regularly, including checking the level and specific gravity of the electrolyte. I do this monthly. While our battery bank was less expensive than Lithium Ion or other more advanced technologies, it’s still a $3K investment and we’d like to get 7-10 years out of it, which requires a certain amount of care and vigilance. The Outback MATE3s is the “brain” of the system, offering system monitoring, programmable settings and parameters, and data logging. Another thing to watch is the array production. 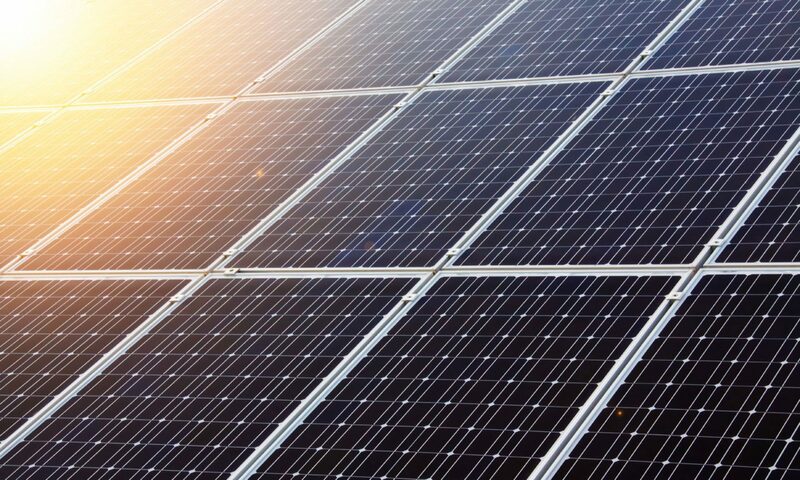 Since our system pushes excess power to the grid, it’s ideal to have the solar panels producing maximum power even when the battery bank is full. 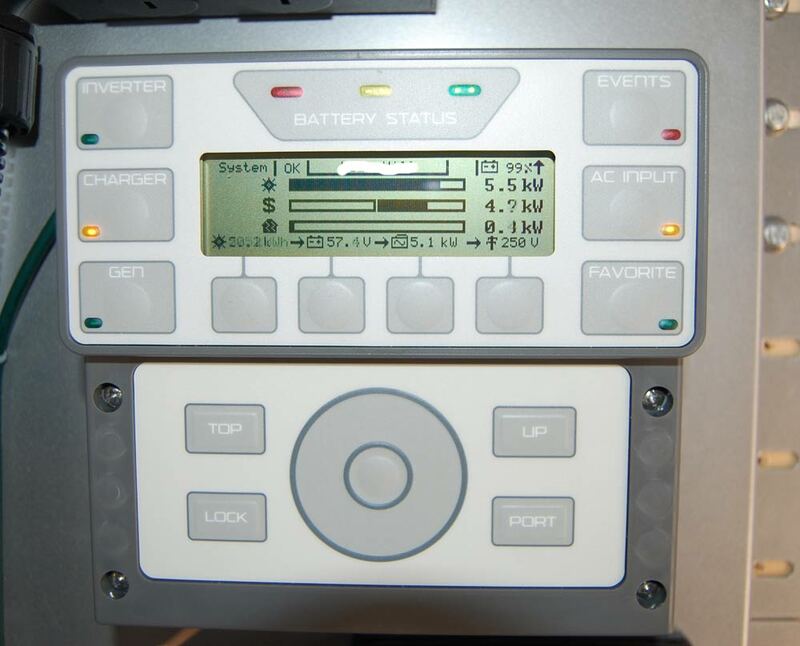 This involves setting a “sell voltage” at the desired float voltage–and having the charge controllers aiming at a higher voltage so that they’re pulling as much current as possible from the array, trying to raise the voltage (which doesn’t rise because once the system reaches the selling voltage any additional power from the array simply ends up as additional current flowing to the grid). Overnight a small amount of battery power is consumed by the system idling. To restore the bank back to 100% state of charge the next day, the voltage from the array needs to be boosted for a period, called “absorption,” to squeeze the last few amp-hours back into the battery bank. We’ve set ours so that every morning the charge controllers run a 20 minute absorption phase before selling excess power to the grid. If we were to discharge the battery bank significantly during the night–say we had a power outage–then the absorption phase would run more like 3-4 hours. The idea is to make sure the batteries are “topped off” before selling any power to the grid. The panels themselves stay pretty clean just from periodic rain–and in the winter the snow generally slides off the 45 degree pitch pretty quickly. Fortunately the solar panels themselves need virtually zero maintenance–which is a good thing because I’m not keen on getting back up on that roof! In the winter I’ll sometimes brush off snow with a wide pushbroom where I can reach, but since our panels are mounted at a 45 degree angle, the snow generally slides off the panel face on its own after a day or two, depending on weather conditions. During the spring and summer dust and pollen accumulating on the panels can diminish their production slightly, but in my experience the rain washes that stuff right off. Initially we had some issues where I noticed power production was off on occasion, but after dialing in the settings the system became pretty much “set it and forget it.” We still check on it daily to make sure all’s well but for the most part there’s no adjustment needed. All in all, monitoring and maintaining the system has been pretty easy. It’s not hard to get a little obsessive fine-tuning the controls, but that’s a good way to learn all the little nuances. Probably the task I’m most inclined to put off is checking the battery electrolyte with a hydrometer (24 cells need to be checked! ), but once a month is certainly not a big deal, and it’s good to verify that the batter bank is truly at 100% state of charge–the only sure way to know that is with a hydrometer. And to be honest, checking the array production on a bright sunny day is awfully satisfying when you see those kilowatts being created by nothing but sunshine. It still seems like magic.